Calculation of interaction energies is one of those things people are more concerned with and is also something mostly done wrong. The so called ‘gold standard‘ according to Pavel Hobza for calculating supramolecular interaction energies is the CCSD(T)/CBS level of theory, which is highly impractical for most cases beyond 50 or so light atoms. Basis set extrapolation methods and inclusion of electronic correlation with MP2 methods yield excellent results but they are not nonetheless almost as time consuming as CC. DFT methods in general are terrible and still are the most widely used tools for electronic structure calculations due to their competitive computing times and the wide availability of schemes for including terms which help describe various kinds of interactions. The most important ingredients needed to get a decent to good interaction energies values calculated with DFT methods are correlation and dispersion. The first part can be recreated by a good correlation functional and the use of empirical dispersion takes care of the latter shortcoming, dramatically improving the results for interaction energies even for lousy functionals such as the infamous B3LYP. The results still wont be of benchmark quality but still the deviations from the gold standard will be shortened significantly, thus becoming more quantitatively reliable. There is an online tool for calculating and adding the empirical dispersion from Grimme’s group to a calculation which originally lacked it. In the link below you can upload your calculation, select the basis set and functionals employed originally in it, the desired damping model and you get in return the corrected energy through a geometrical-Counterpoise correction and Grimme’s empirical dispersion function, D3, of which I have previously written here. Here’s a screen capture of the outcome after uploading a G09 log file for the simplest of options B3LYP/6-31G(d), a decomposed energy is shown at the left while a 3D interactive Jmol rendering of your molecule is shown at the right. Also, various links to the literature explaining the details of these calculations are available in the top menu. I’m currently writing a book chapter on methods for calculating ineraction energies so expect many more posts like this. A special mention to Dr. Jacinto Sandoval, who is working with us as a postdoc researcher, for bringing this platform to my attention, I was apparently living under a rock. 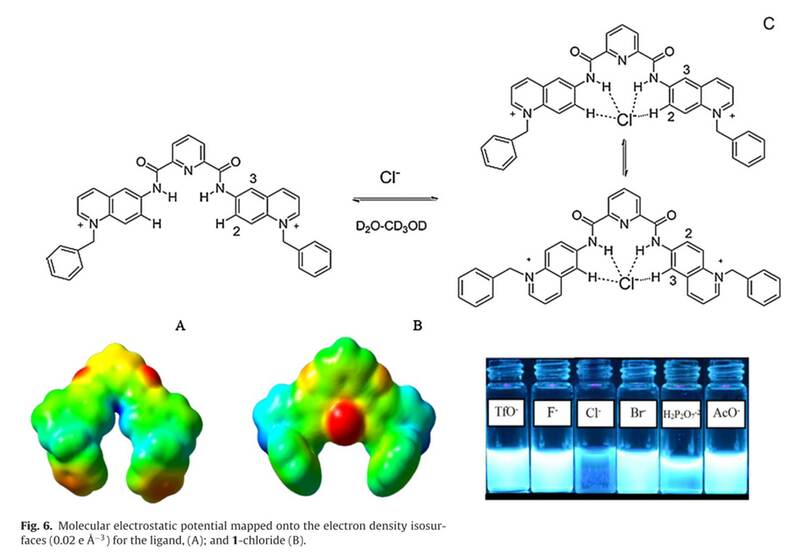 A new publication is now available in which we calculated the binding properties of a fluorescent water-soluble chemosensor for halides which is specially sensitive for chloride. Once again, we were working in collaboration with an experimental group who is currently involved in developing all kinds of sustainable chemosensors. The electronic structure of the chromophore was calculated at the M06-2X/6-311++G(d,p) level of theory under the SMD solvation model (water) at various pH levels which was achieved simply by changing the protonation and charges upon the ligand. Wiberg bond indexes from the Natural Population Analysis showed strong interactions between the chloride ion and the chromophore. 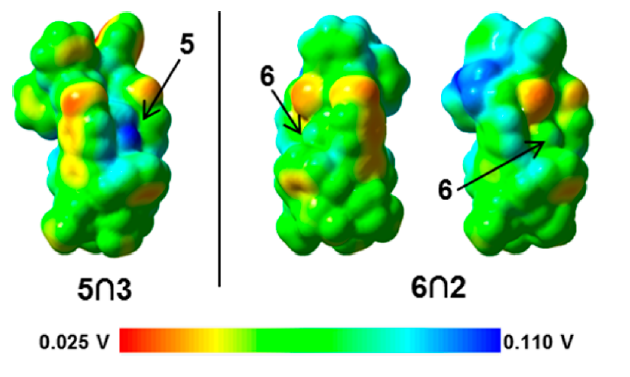 Also, Fukui indexes were calculated in order to find the most probable binding sites. A very interesting feature of this compound is its ability to form a cavity without being a macrocycle! I deem it a cavity because of the intramolecular interactions which prevent the entrance of solvent molecules but that can be reversibly disrupted for the inclusion of an anion. In the figure below you can observe the remarkable quenching effect chloride has on the anion. A quick look to the Frontier Molecular Orbitals (FMO’s) show that the chloride anion acts as an electron donor to the sensor. Thanks to Dr. Alejandro Dorazco from CCIQS for asking me to join him in this project which currently includes some other join ventures in the realm of molecular recognition. Well, I only contributed with the theoretical section by doing electronic structure calculations, so it isn’t really a paper we can ascribe to this particular lab, however it is really nice to see my name in JACS along such a prominent researcher as Prof. Chad Mirkin from Northwestern University, in a work closely related to my area of research interest as macrocyclic recognition agents. In this manuscript, a calixarene is allosterically opened and closed reversibly by coordinating different kinds of ligands to a platinum center linked to the macrocycle. (This approach has been referred to as the weak link approach.) I recently visited Northwestern and had a great time with José Mendez-Arroyo, the first author, who showed me around and opened the possibility for further work between our research groups. Here at UNAM we calculated the interaction energies for the two guests that were successfully inserted into the cavity: N-methyl-pyridinium (Eint = 57.4 kcal/mol) and Pyridine-N-oxide (Eint = +200.0 kcal/mol). Below you can see the electrostatic potential mapped onto the electron density isosurface for one of the adducts. Relative orientation of the hosts within the cavity follows the expected (anti-) alignment of mutual dipole moments. At this level of theory, we could easily be inclined to assert that the most stable interaction is indeed the one from the semi-open compound and that this in turn is due to the fact that host and guest are packed closer together but there is also an orbital issue: Pyridine Oxide is a better electron acceptor than N-Me-pyridinium and when we take a closer look to the (Natural Bonding) orbitals interacting it becomes evident that a closer location does not necessarily yields a stronger interaction when the electron accepting power of the ligand is weaker (which is, in my opinion, both logic and at the same time a bit counterintuitive, yet fascinating, nonetheless). All calculations were performed at the B97D/LANL2DZ level of theory with the use of Gaussian09 and NBO3.1 as provided within the former. Computing time at UNAM’s supercomputer known as ‘Miztli‘ is fully acknowledged. Thanks to José Mendez-Arroyo for contacting me and giving me the opportunity to collaborate with his research; I’m sure this is the first of many joint projects that will mutually benefit our groups. Having a new paper published is always a matter of happiness for this computational chemist but this time I’m excedingly excited about anouncing the publishing of a paper in the Journal of Chemical Theory and Computation, which is my highest ranked publication so far! It also establishes the consolidation of our research group at CCIQS as a solid and competitive group within the field of theoretical and computational chemistry. The title of our paper is “In Silico design of monomolecular drug carriers for the tyrosine kinase inhibitor drug Imatinib based on calix- and thiacalix[n]arene host molecules. A DFT and Molecular Dynamics study“. In this article we aimed towards finding a suitable (thia-) calix[n]arene based drug delivery agent for the drug Imatinib (Gleevec by Novartis), which is a broadly used powerful Tyrosine Kinase III inhibitor used in the treatment of Chronic Myeloid Leukaemia and, to a lesser extent, Gastrointestinal Stromal Tumors; although Imatinib (IMB) exhibits a bioavailability close to 90% most of it is excreted, becomes bound to serum proteins or gets accumulated in other tissues such as the heart causing several undesired side effects which ultimately limit its use. By using a molecular capsule we can increase the molecular weight of the drug thus increasing its retention, and at the same time we can prevent Imatinib to bind, in its active form, to undesired proteins. We suggested 36 different calix and thia-calix[n]arenes (CX) as possible candidates; IMB-CX complexes were manually docked and then optimized at the B97D/6-31G(d,p) level of theory; Stephan Grimme’s B97D functional was selected for its inclusion of dispersion terms, so important in describing π-π interactions. Intermolecular interaction energies were calculated under the Natural Bond Order approximation; a stable complex was needed but a too stable complex would never deliver its drug payload! This brings us to the next part of the study. A monomolecular drug delivery agent must be able to form a stable complex with the drug but it must also be able to release it. Molecular Dynamics simulations (+100 ns) and umbrella sampling methods were used to analyse the release of the drug into the aqueous media. 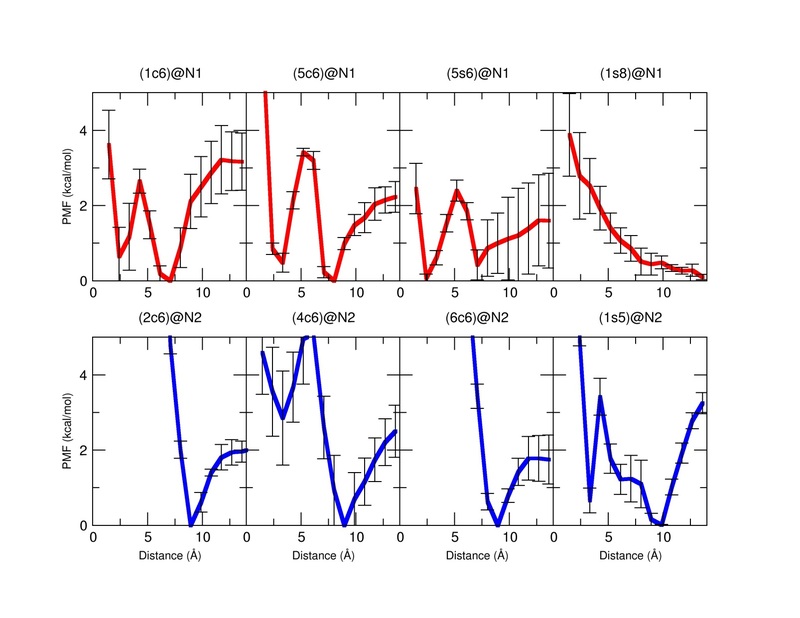 Potential Mean Force profiles for the four most stable complexes for position N1 and N2 from the QM simulations are shown below (Red, complexes in the N1 position, blue, N2 position). These plots, derived from the MD simulations give us an idea of the final destination of the drug respect of the calixarene carrier. In the next image, the three preferred structures (rotaxane-like; inside; released) for the final outcome of the delivery process are shown. The stability of the complexes was also assessed by calculating the values of ΔG binding through the use of the Poisson equations. Thanks to my co-authors Maria Eugenia Sandoval-Salinas and Dr. Rodrigo Galindo-Murillo for their enormous contributions to this work; without their hard work and commitment to the project this paper wouldn’t have been possible. I’m quite late to jump on this wagon but nonetheless I’m thrilled about this year’s Nobel Prize in Chemistry being awarded to three awesome computational chemists: Martin Karplus (Harvard), Michael Levitt (Stanford) and Arieh Warshel (USC) for the development of computational models at the service of chemistry; most prominently, the merging of computations both at the classical . and quantum levels, the former allows for a computationally feasible calculation while the latter provides the needed accuracy for the description of a chemical process. As a computational chemist myself I must say that, at some level, it feels as some sort of vindication of the field, which makes me wonder if it indeed needs it, I don’t think so but maybe some might. Last week, Nobel week, I attended a symposium on the Advances in Quantum Chemical Topology where big names such as Paul Ayers, Paul Popelier and Chérif Matta among many others participated along with my friends and colleagues from CCIQS, Fernando Cortés (whom actually organized the whole thing! Kudos, Fer!) and Vojtech Jancik who contributed to the experimental (X-ray diffraction methods) part of the symposium. Surprisingly nobody at the conferences mentioned the Nobel Prize! Not even during the round table discussion titled “The Future of Quantum Chemical Topology“. At some point during this discussion the issue of usefulness came out. I pointed out chemists have this inherent need of feeling useful, including computational chemists, as opposed to physicists of any denomination. Computational or theoretical chemists try to be like physicists yet still have chemistry behavior baggage. Even more baffling is the fact that at such an abstract conference usefulness is discussed, yet those theoretical chemists who do not develop new methods, nor dwell into equations or propose new Hamiltonians, but rather make use of well established methodologies for tackling and solving particular problems in chemistry become somewhat ostracized by the theoretical chemistry community*. Much controversy among the comp.chem. community was aroused by this much deserved award (try reading the comment section on this post by the great Derek Lowe at In The Pipeline). Here in Mexico we have a saying: “Ni son todos los que están ni están todos los que son” which is hard to translate given the two different meanings of the verb To Be, but it can be roughly translated as “Not all the ones who should be are present, nor the ones that are present are all that should be“, or something like that. Of course there are many other computational chemists that are left behind from this prestigious prize, but the contributions of Karplus, Levitt and Warshel to chemistry through the use of computational chemistry can be denied. 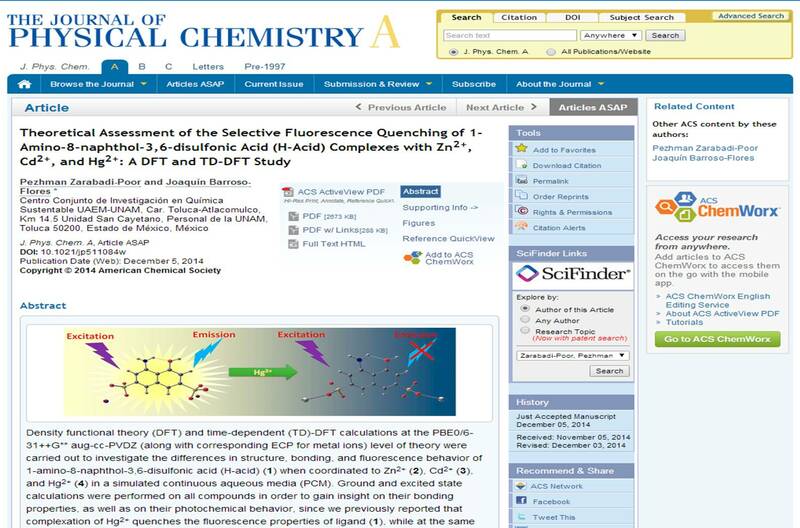 In fact this does vindicate the field of comp.chem. 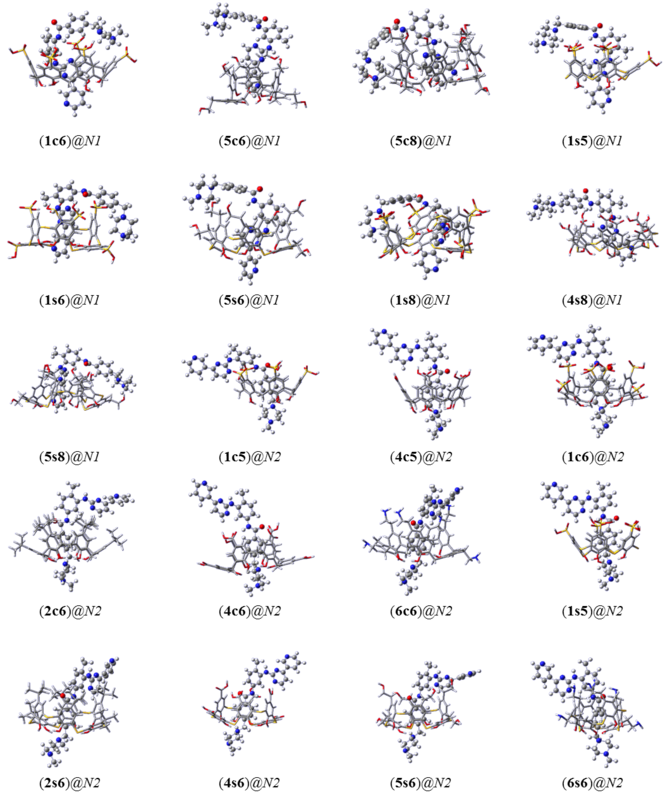 by acknowledging the importance of modelling in molecular design and reactivity understanding. 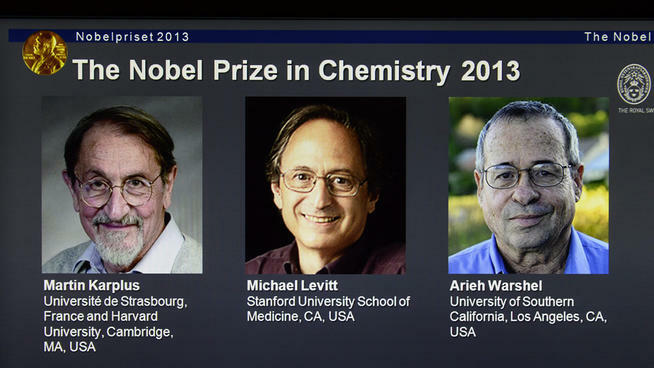 Congratulations from a Mexican fan to Professors Karplus, Levitt and Warshel for the most deserved Nobel Prize in Chemistry 2013! PS a much better post on this topic can be found at the curious wavefunction.